The basis of my training stems from my conviction that dogs are pack animals and that every pack has a leader and wants a leader. A confident, well adjusted dog is one that knows not just who his leader is but that he can expect consistent and fair direction from that leader. A dog that doesn’t trust it’s human to be a good pack leader becomes unbalanced and will often exhibit negative behavior. Dogs need a job. There is a feeling of fulfillment, a sense of accomplishment people achieve in getting some work done before resting at the end of the day. In this respect your dog’s situation may not be that different from your own. Some breeds of dogs are not bred to sit around all day. They actually possess a craving for work and if they don’t have a purpose, or a job of their own to do, they will find one – like digging, chewing, barking or other undesirable behaviors. Now I’m not suggesting that these dogs need a forty-hour a week job. It doesn’t take that much to satisfy their need for a purpose. Obedience training can actually give them the job they need and a chance to accomplish something satisfying. The Pace Method is simply teaching you to understand how your dog thinks, learns and communicates by helping you understand the psychology of your dog. Our obedience course is a one on one individualized approach. 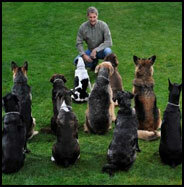 Our course is designed to teach you, your dog’s owner, to be a leader. By understanding your dog you will learn how to re-direct your dog’s focus to you. We teach people to be assertive, patient and consistent when applying our positive training techniques. The Pace Method teaches you how to communicate to your dog in a timely and meaningful way using a leash, collar, your voice, and your body language to show your dog what you want it to start doing, stop doing or continue doing. Our effective leash and collar technique is done with a very gentle tug and release of the leash. We reward your dog with verbal and physical praise for their positive behavior. Once the training foundation is laid it is very important to be consistent on a day to day basis so you do not confuse your dog. By being consistent you will establish trust and understanding with your dog. Canyon Crest K-9 Training Center, of Tacoma Washington, methods are unique. We realize that every owner has specific needs, wants and desires. We want your training program to be fun and rewarding for you and your dog. We work with you to achieve your goals to the fullest. We encourage you to come and observe to see for yourself exactly how we teach.